As seen in Naval Visits to Pittwater 1788-1952 the testing of torpedoes in Pittwater has numerous instances prior to the establishment of the torpedo wharf at Taylor's Point. Shipmasters and others are hereby notified that Torpedo Practice will take place In Pittwater, commencing on 10th October, and continuing dally (Saturdays and Sundays excepted) until 27th October, 1933. Practice will only take place between the hours of 8 a.m. and 12 noon, and between 1 p.m. and 4p.m. Torpedoes will be fired from a destroyer anchored towards the southern end of Pittwater, near Taylor's Point, in a northerly direction of Observatory Point. Mark buoys will be laid at the northern end of torpedo range. A red flag will be flown by the destroyer while practice is in progress, and a red flag will be flown by a motor launch in the vicinity of Rock Head, when range is dangerous. Vessels are not to proceed south of Observation Head or north of destroyer when these signals are flying. On the 26th of March 1941 the trawler Millimumul was sunk east of Broken Bay after hitting a mine laid by Pinquin, a German auxiliary cruiser. As May became June in 1942 torpedos from Japanese miniature subs were fired at Bondi, Bellevue Hill and into Sydney Harbour, sinking HMS Kuttabl and killing some of the young men billeted onto this vessel. As early as 1940 Australia began to lose ships to mines laid by German vessels off our Victorian coast and ships further at sea to torpedo attacks. Protection against further attacks and preparations against invasion were crucial. The manufacture of torpedos within Australia, decentralising this weaponry production from Britain, came as a request from Admiralty. THE decision to manufacture torpedoes in Australia, taken at a meeting of the War Cabinet on 22nd December 1941, committed the country 's precision engineering to a most difficult undertaking; by reason of the position occupied by torpedoes among modern armaments, the undertaking was one of great potential importance . With sea power as the corner-stone of Britain's dominant strength among world powers in the nineteenth century it is not surprising that the development of the torpedo was essentially a British achievement, though it was not in the first instance a British invention). Britain's early lead in the adoption of the torpedo owed much to the enthusiasm of Commander (later Admiral Lord) Fisher, but other great powers were not long in entering the field. The tremendous possibilities of the weapon were first apparent during the war of 1914-18 when Germany, by means of the U-boat and the torpedo, inflicted such heavy losses on merchant shipping that she very nearly brought Great Britain to her knees. During the two decades that followed the first world war the torpedo acquired even greater destructive potentialities by the development of methods for dropping it from aircraft, and no great insight was required to predict the part the torpedo would play in a future war. The manufacture of torpedoes in Britain was carried out principally by a private firm, the Whitehead Torpedo Company, which manufactured for all corners, and by the Admiralty at Greenock, Scotland . In July 1941 the Admiralty, concerned at the possibility that Britain 's production of torpedoes might be hindered if not prevented altogether by bombing or invasion, began to investigate means of providing alternative centres for such an emergency. Manufacture in Britain had been decentralised as far as practicable but nothing had been done towards establishing centres outside Britain. The final and most important of all the tests applied to a torpedo was ranging, which consisted of firing it from a discharge tube located on shore over a carefully selected stretch of water. During ranging the war head was replaced by a dummy head filled with water. At the end of the run the water was expelled and replaced by air, which caused the torpedo to float upright and so made it easy to recover. The direction, depth and speed were closely observed and noted with special instruments. THE BUILDING HOUSING THE TORPEDO FIRING GEAR AT THE RAN TORPEDO FIRING RANGE AND THE JETTY OF THE RAN TORPEDO RANGE, LOOKING LANDWARD, SHOWING THE TRAMWAY IN USE. (NAVAL HISTORICAL COLLECTION). Images no: 306035 and 306036, courtesy Australian War Memorial. A range surveyed by the Hydrographic Branch of the R .A.N. 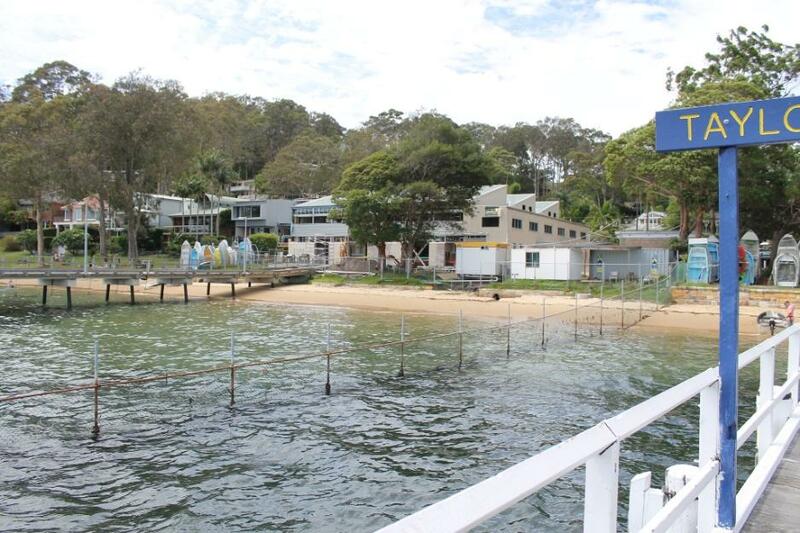 was set up at Pittwater, in Broken Bay, 30 miles north of Sydney. Firing tubes, observation station, workshop, pier and target rafts were designed and erected while the torpedoes were being made. Normally every torpedo was ranged twice. The ranging of the first Australian-made torpedo at Pittwater on 24th February 1944 was a signal success ; it sailed straight through all Admiralty tests without needing any of the small adjustments that are often called for in a first trial. The range officer, Lieutenant Owens, reported, "the performance of this torpedo could not be bettered" . By late 1943 the first Australian made torpedoes were being tested at Pittwater. R.A.N. TORPEDO RANGE, PITTWATER, N.S.W. The R.A.N. Torpedo Range is situated in Broken Bay, N.S.W., the firing point being on Taylor's Point, Pittwater, and the range extending from there in a northerly direction. 1—No. 21-in. above water firing tube. 1—No. 21-in. submerged firing tube. There is also a launching cradle for use in running torpedoes not otherwise catered for. Left: Recovered Torpedo at RAN Torpedo Range, Pittwater, 1949, courtesy Robert Curran. 4. The Torpedo Range workshop is capable of carrying out complete overhauls on all torpedoes. 5. Applications for torpedoes to be ranged should be made by signal to Admiral Superintendent, Sydney, repeated for information to Superintendent, R.A.N. Torpedo Factory. 6. Transport of torpedoes from the ship's side to the range and return will be arranged by the Superintendent, R.A.N. Torpedo Factory. Pittwater after World War II had become a more residential area with young families as much as retirees finding such a beautiful place so close to a city center, and afforable then, more and more attractive. Taylor’s Point Reserve Proposal to Occupy, for the purposes of the Torpedo Station, an additional area of the reserve immediately adjacent to the Station on its western side and in front of the swimming baths: A further letter, dated 8th anat. from the State War Effort Co-ordination Committee, together with the accompanying copy of, a letter received by that Comnittee from the Department of the Interior further in regard to this Taylor matter was read, and 'explanatory plan received with such letter was displayed. After discussion it was resolved, That the State War Effort Co-ordination Committee be informed that if the Authorities concerned will agree to remove the public baths to a position on the eastern side of the building, as suggested at the conference, the Council will raise no objection to the occupation by the Commonwealth for the duration of the war of the additional area on the western side of the building as shown on' the plan. (Crs. Batho, Langdale) Further in regard to the matter the President pointed out that the torpedo practice operations could extend from Taylor's point Reserve northwards nearly to Lion Island, and would interfere with the use of that portion of Pittwater by the public on occasions. On his motion, seconded by Cr. Batho, it was resolved; - That a letter be sent to the Department of the Navy for an assurance that the mooring of punts in Pittwater will not be a permanent thing after the war's end that a copy of such letter be sent to Mr. Spender, the Federal Parliamentary member for the district. Hon. P.C. Spender, M.H.R. 22/2/44, forwarding letter from the Minister for the Navy regarding torpedo-testing range at Pittwater, in which it is stated that from time to time it will be necessary to run torpedoes for testing purposes, and when this is being done pod flags will be flown from suitably placed pontoons, and a siren sounded to warn persons to keep clear of the range; also that it is not proposed to declare the land adjoining the naval waters a prohibited area, and that the range will be required for the period of the war and possibly longer. "Received"
4th March, 1980 3.0 CATEGORY "Re CORRESPONDENCE - 3.1 Royal Australian Navy - Resumption of Torpedo Ranging - Pittwater. (File SF 2246/172-174) Advising that torpedo ranging will be resumed at Pittwater on 9th April, 1980 and that arrangements have been made to place temporary notices on the approaches to the Clareville, Paradise & Snapperman beaches on the days when firings are scheduled; notices will also be published in the local press. Submittor (06) Royal Australian Navy (HMAS Penguin) Issue The Navy has provided details on the proposed relocation of a number of boat moorings at Taylors Point. Approximately 80 buoys located in Naval waters off Taylors Point are restricting access to both Naval and public wharfs. The commanding officer of HMAS Penguin, who is responsible for the administration of that part of Pittwater controlled by the RAN has requested the MSB to relocate about 15 buoys. The RAN has never given authorisation for moorings to be located in waters which it controls. The proposed relocation has been made necessary by the requirement to ensure safe and reasonable access to the wharves at Taylors Point. A sketch showing the moorings in question was attached to this submission. The RAN proposes to contact the owners of the moorings before relocation occurs. Comment The Navy's comments have been noted. Further consultation should occur with MSB Waterways Authority regarding a number of moorings to be allocated in the Clareville - Taylors Point area. Further review of the recommended maximum number of moorings in Area 5 or the configuration of this area as indicated in Map 2 and Table 2 in Section 6.3 of the draft DCP/Policy may be required. This matter will be discussed at the next meeting of the Pittwater Planning Advisory Committee. Australia Day, 2013. Picture by A J Guesdon. Pittwater's Torpedo Wharf and Range threads collected by A J Guesdon, 2013.